The other day we celebrated Mrs. Paleovirtus’ birthday, which in this family can only mean one thing – a visit to our favourite restaurant in town, Kin Long. This entry was posted in Eating out, Food Diary and tagged Chinese, Kin Long, Malmö, restaurant, Sweden on January 14, 2015 by paleovirtus. We needed a new mat for under our kitchen table, and this being a Swedish family, there was only really one place we were ever going to buy it, so off we headed to the 2nd. largest IKEA store on the planet, handily located on the Southern edge of town, Mrs. Paleovirtus and Paleovirtus Jr. by bus and train, myself by bicycle. Just like our Danish cousins on the other side of the Öresund strait in Copenhagen, we live in a very cycle friendly city – thanks to the 300+ kilometres of cycle path we enjoy I was able to cover the 9km between our home and IKEA without once leaving dedicated bike lanes. This entry was posted in Eating out, Food Diary and tagged A nice night, IKEA restaurant, paleo, salad, salmon on November 16, 2014 by paleovirtus. When you’re dining out, sometimes you have to be prepared to engage in a bit of a debate with the staff at your chosen eatery in order to trim a dish on the menu of its Paleo un-friendly bits. Hopefully, you eventually arrive at a place that suits both parties – they still get to sell you food, and you get to avoid going hungry while having to watch all your non-Paleo companions stuff their faces. The owner at Syltan, which Mrs. Paleovirtus frequents every Tuesday due to its Pub Quiz evening, was more than happy to serve me with their Prawn Sandwich, minus the bread. I was still left with a veritable mountain of tasty shellfish, a good wedge of salad, and plenty of creamy mayonnaise on my plate, so I in turn was more than happy to shovel it down. Everybody happy. I declare that to be a fine result all round. Hurrah! We came second in the quiz, by the way, missing out on the top spot by a mere point-and-a-half, despite the quite noticeable boost my cognitive powers got from all that shellfish. 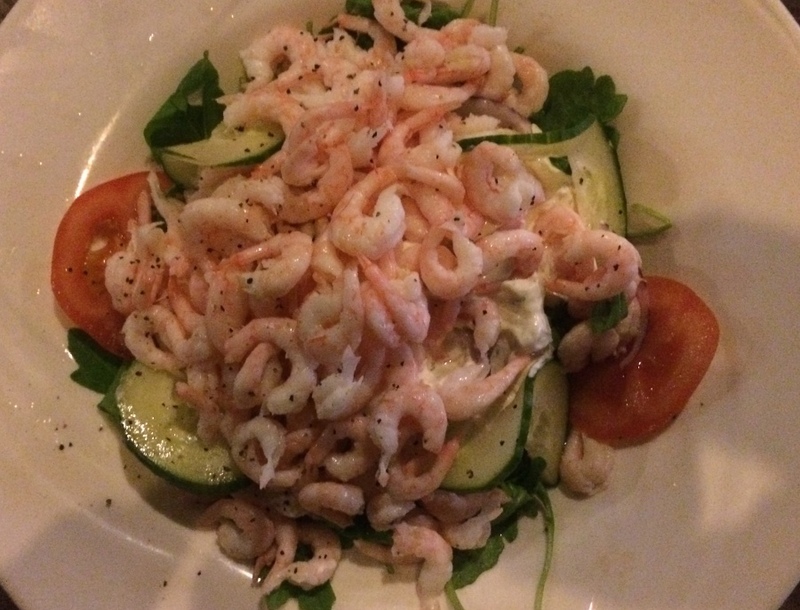 This entry was posted in Eating out, Food Diary and tagged mayonnaise, paleo, prawns, salad on August 27, 2014 by paleovirtus. Friday 11/07/14 was the last day of our Summer holiday in St. Ives, so to mark the occasion we had dinner at the fabulous Beach Restaurant. Although the menu itself wasn’t exactly terribly Paleo friendly, with the usual bread, dairy, and potatoes present in abundance, the staff and kitchen were more than happy to omit / add / juggle things around a bit to accommodate my caveman cravings. And so it came to pass mes braves that I begun my meal with a very nice smoked mackerel and sun-blushed tomato pate with salad. So nice it was that it was gobbled up before a photograph could be taken of it. Main course was a beautiful piece of salmon, grilled to perfection, with a side salad. Note dressing “on the side”. Every bit as scrumptious as the grilled cod I had there in January. 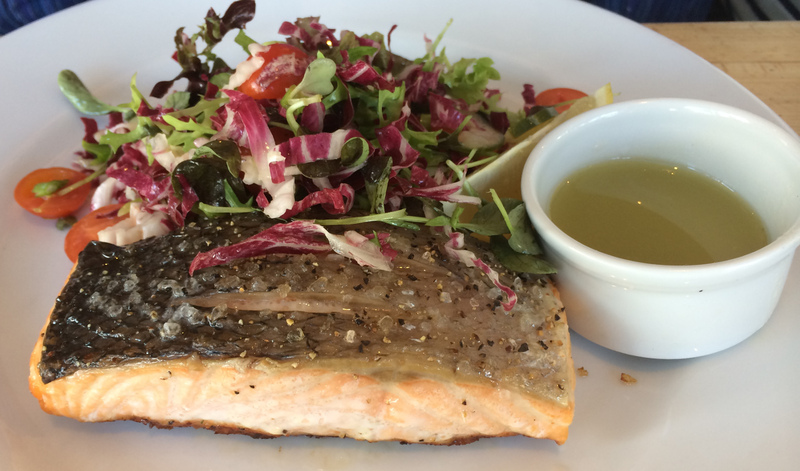 This entry was posted in Eating out, Food Diary and tagged Beach Restaurant St. Ives, grilled, salmon on July 13, 2014 by paleovirtus. 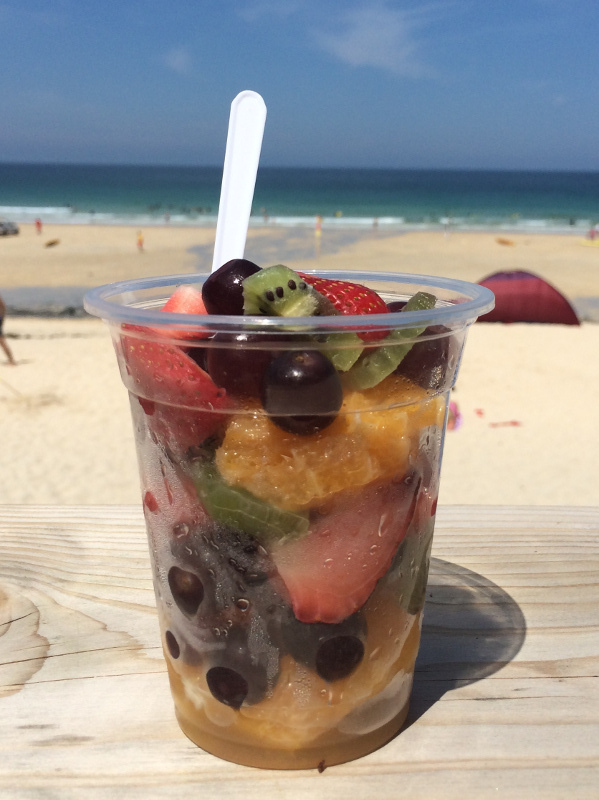 Blue sky, golden sands, and a rainbow in a cup. Add green tea and even this colour-blind individual is open to a spot of chromotherapy. 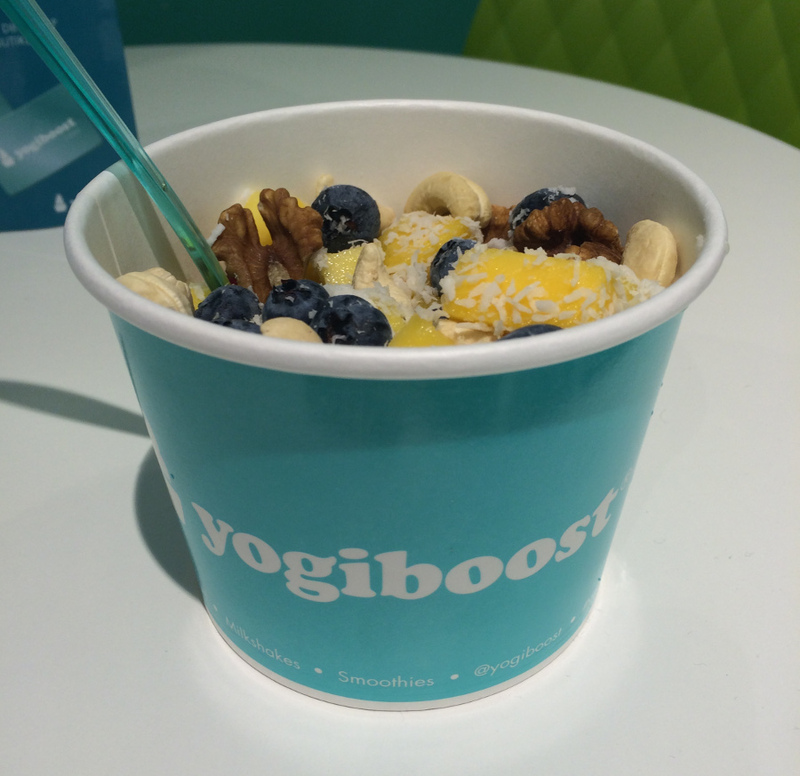 This entry was posted in Eating out, Food Diary and tagged eating out, fruit, paleo, salad on July 12, 2014 by paleovirtus.